Fences have been around for centuries. They have created the lines between “ours” and “theirs.”.Homes weren’t considered to be entirely protected if they didn’t have fences. They can be used to define who owns what property. They can signal invitations to “come in” or “stay out.” The interpretation is usually up to the owner to convey and is personal. There are even places where a fence might be a legal necessity; for example, if you have a swimming pool or pond, some municipalities require a safety fence, many with locked gate. The ultimate fence in most of the world has been a hedge. The white picket fence also has functioned as the backdrop to many plantings and protected gardens from unwanted animals trespassing into the garden. It is a prerequisite for the cottage garden. Piled stone is sometimes used as a natural-looking fence. How and what kind of fence to build depends on its location and intended use. What will work for you and your home depends on your landscape, the appearance of your home, and your purpose for wanting a fence. When fences and plantings are combined, some natural considerations are to view how much air movement and light the fence will get. If the planting’s foliage is too dense and close to the fence, it will block the air, causing the humidity to increase and possibly moss or mildew to form if the fence is wooden. If the fence is chronically damp the paint will start to blister and flake, once the wood is exposed it can start to rot. An open fence like a white picket fence with evenly spaced boards or pickets as opposed to a closed fence with overlapped boards will be less apt to suffer from premature decay. Also, minimizing the number of joints will eliminate places that can hold water. On fences where the wood is going to be supporting plants it’s best to use treated wood. It is also a deterrent for carpenter ants and termites. In cold parts of the country, the fence bottom should never be touching the ground because frost can heave the fence up and lift it off the ground. Mulch shouldn’t be placed right around the supports of the fence either; introduce a no-mulch zone to protect your fence posts. Fences are just one of the many elements you can include in your landscape to define your property or specific areas, provide privacy, or present a backdrop for a dramatic planting. 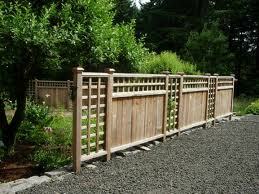 If you have questions about how a fence might work in your landscape, please give us a call.